It used to bother me greatly that so many times in the middle (or at the end) of a drawing or painting, I’d get all contaminated with words, and felt I couldn’t do justice to something without a verbal or written explanation. I actually did this once, and it irritates me to this day that I did. I should have just left the painting to interpretation, but the words budged their way in, and wouldn’t be dismissed. The painting above is probably one of the few that didn’t suffer that fate. It’s really as much a self-portrait as anything, done my junior year of high school. 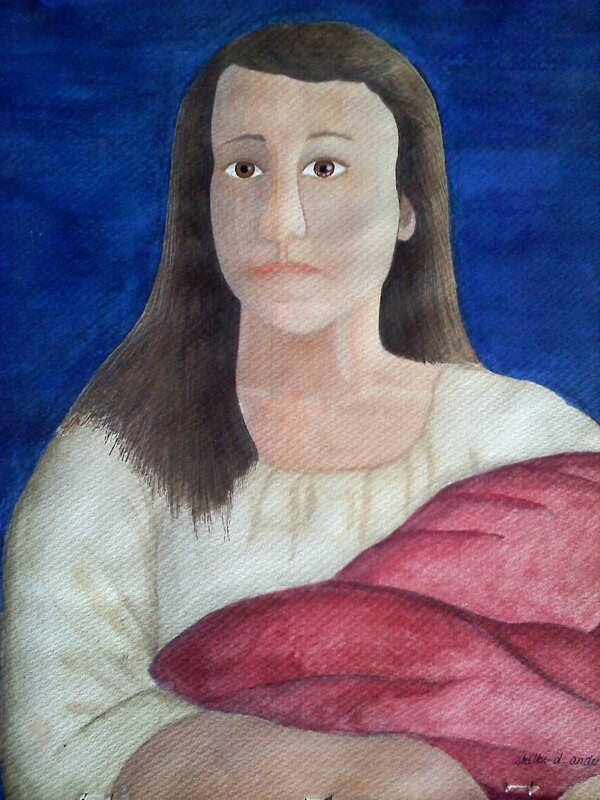 The assignment was to do a painting in the style of another artist -one part art history, one part practice, I suppose. This, if I remember correctly, took me a good part of the year. 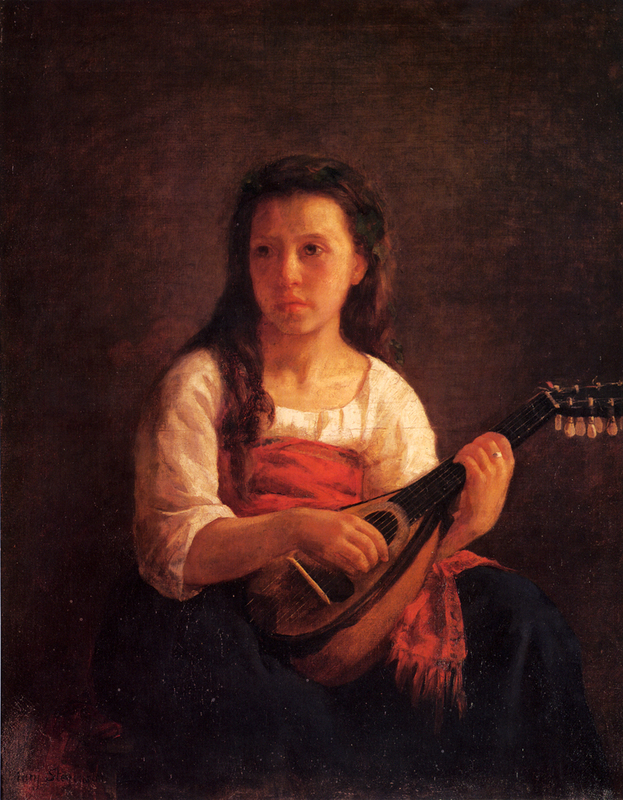 It was patterned on a not well-known painting of Mary Cassatt, The Mandolin Player. I was intrigued by the original painting because it was one of only a few of hers that didn’t feature a mother and child. It was a melancholy sort of piece, done in browns and darker colors. I found this a few weeks ago while I was looking for something else, and thought I’d revisit some of the research I did back then. Mary Cassatt, of course, never married, never had children. She had something of a tumultuous relationship with Edgar Degas, but she never talked much of the nature of that relationship. Rumor has it that she actually burned their correspondence after Degas’ death. We’ll never really know what happened there, but mystery makes for great stories, and for that, I’ve always had a special place in my heart for Miss Cassatt. The fact that she never had children herself, but is best known for her portraiture of mothers and children is one of the great ironies of her life. I chose the painting I did because it was so different from her other works, but I made some changes -I replaced the mandolin with a bundle. I had imagined it as a child at the time, as if to fulfill Mary’s wish at least in my mind. I felt sort of sad for her, although I don’t think I would have realized (or admitted) it at the time. And I changed her color scheme. I felt a deep blue was better for the mood of the piece, maybe adding some hope, some depth in a way that brown didn’t. Beside that, blue was far more powerful, and it was the one color I chose straight from the tube because the intensity of it made me happy. It wasn’t until I really looked at this painting again a few weeks ago, though, that I realized that I never really did give her a child, but a bundle. In looking back, I think now that as much hope as I had (for her and for me), I couldn’t quite get to the place where I could know what really was in that bundle. Maybe that’s why I left it a mystery. It makes me laugh that it is so much easier (sort of…) for me to write about this than it was to paint it. In class last week (I’m taking a class on Fiction Writing, another enterprise that is about as natural to me as quantum physics –I don’t even really read that much fiction, but I figure it’s what we know least that we need to learn most, right? ), our prof said something that made the lights in my mind finally come on –writing is seeing. And it suddenly occurred to me that the act of painting and the act of writing, of storytelling, is really quite related, if not the same. The tools and the method of execution are entirely different, but both begin with seeing. If we do not see well, we will never create well, be our tools paint or words. So really, those words that kept barging their way into my drawing and painting weren’t out of place at all, they were just the tools I am more at ease with using. And maybe that’s not a terrible thing, after all. The book goes on to tell the story of how an artist really finds joy in recapturing what has already been created. It’s a wonderful little book, because however presumptuous it sounds to compare oneself with God, it gets at the heart of things. Creativity is about taking the material around us, what we see and experience, and putting it all together into something new to offer to each other and back to God himself. Of course, Solomon was right, there really is nothing new under the sun, but what I see of this world is not going to be the same as what you will see, and what a good story, a good painting, a good piece of music really does in a sense, is to give us a window (sometimes a door) into the soul of another person’s life and, hopefully, inspire us to look –really look–– at what passes us by every day by seeing behind the eyes of someone else. Millions of pairs of eyes and ears and feet in this world –think of the possibilities!